Hastings Congress final day provided entertainment up until the bitter end with several of the prizes unable to be determined until not too long before the closing reception. After a surprising setback at the start of the Masters, Indian grandmaster Deep Sengupta shared first prize with Chinese International Master Yiping Lou, each having a final score of 7 points. Sengupta had a win against Daniel Gormally and Lou drew against Arghyadip Das. The winners shared the first prize – each receiving £1,600 and being jointly awarded the Golombek Trophy by Cllr. 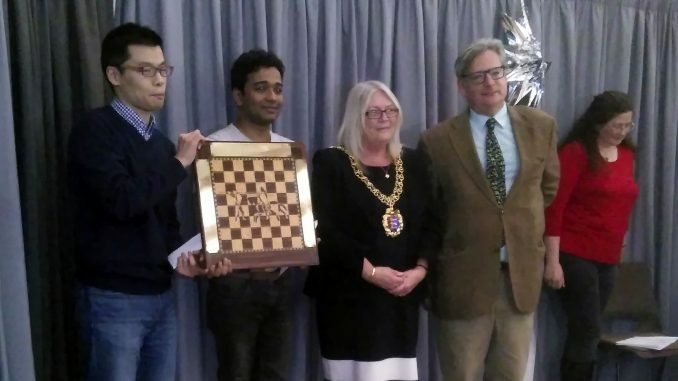 Judy Rogers, Mayor of Hastings and Dominic Lawson, President of the English Chess Federation. Deep’s name already appears twice on the trophy, having won outright in 2016 and jointly with Arghyadip Das in 2010. Yiping Lou is the following in the footsteps of Chinese winner Yue Wang in 2011. Third prize was shared between Uzbek GM Jahongir Vakhidov and Indian IMs Stany and Das on 6.5points. Sixth prize was shared betwween English grandmasters Daniel Gormally, Mark Hebden and Keith Arkell, English IM Stephen Mannion, Iranian FM Borna Derakhshani and Norwegian Pal Royset all on 6 points.. The Horntye Prize of £100 and trophy was won by GM Danny Gormally for his game against Alexandr Fier in Round 6 which was presented by Horntye Trustee, Graham Deaves. The rating performance for a player aged over 65 was won by Bexhill player John Sugden and the Under 18 rating performance prize went to 14 year old Calum Salmons from Brighton – the latter prize being awarded as a lasting contribution by Con Power. Alan Hustwayte’s prize for Best Performance Against Rating went to Portugese player Claudio Boino. As well as the prizes in kind, Hastings once again proved to be a fertile ground for norm achievement possibilities. In the end Yiping Lou achieved a GM norm and Adam Taylor achieved an IM norm. Adam started well here won his first game aganst a GM in the first round. FIDE International Arbiter norms were achieved by Tom Thorpe and Alan Atkinson – Alan had a dual role at the Congress acting as arbiter and photographer. Congress Director, Alan Hustwayte, achieved his International Organiser title. Congress Chairman, Paul Smith thanked the sponsors, Tradewise Insurance Services Ltd and Hastings Borough Council and also thanked the players, organisers and the staff of Horntye Park for their contributions. He wished everyone a safe return home and hoped that they would be back again at the end of this year for the next Congress. As well as those mentioned above the Congress would like to thank the John Robinson Youth Chess Trust for their generous award enabling the congress to give bursaries to a number of entrants under 21. Thanks also go to The White Rock Hotel, The Lansdowne Hotel and KC Computers for their continuing support. At the present time the sponsorships have not been confirmed, but the organisers are hopeful that they will be able to welcome as many players as possible back to Hastings in December.